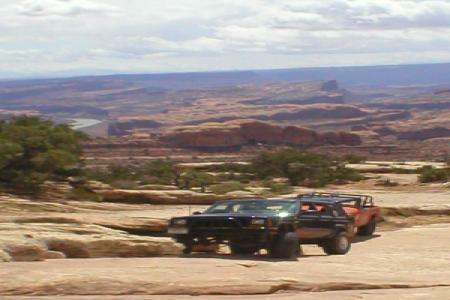 Gold Bar Rim is a cliff rim that stands about 1200 feet above Highway 191's path in Moab Canyon. Because the rocks behind the cliff slope downward to the southwest, the rim has a 360 vista. Gold Bar Canyon drains away from the rim into the Colorado River. The trail climbs the cliff in stages, first angling up to Little Canyon, then working its way across Gold Bar Canyon to follow the slope of the Wingate Sandstone layer up to the rim. Approximate mileages: 47 total, 25 off highway. The Gold Bar Rim vistas take in almost all of the local country, including Moab and its valleys, the La Sal Mountains, the Book Cliffs, and parts of the Colorado River canyon. Most of the miles are typical of our trails, sand punctuated by some surface rocks. 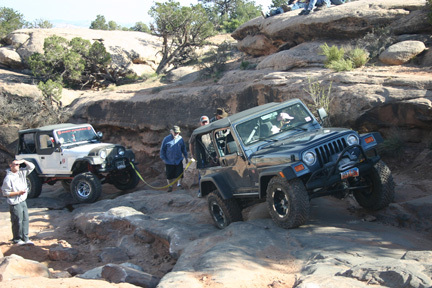 There is quite a bit of slickrock near Gold Bar Rim, a little blow sand in Bull Canyon and Little Canyon bottom, and some rocky wash bottom in Bull Canyon. The scenic view from the rim has already been mentioned. The most difficult four wheeling is in crossing Gold Bar Canyon and then ascending to the rim. Some prefer to walk the last 100 feet to the rim rather than rick the sheetmetal damage that has befallen others on the last rocky step up. The obstacle that drives the trail rating is a big rock ledge on the return across Gold Bar Canyon. 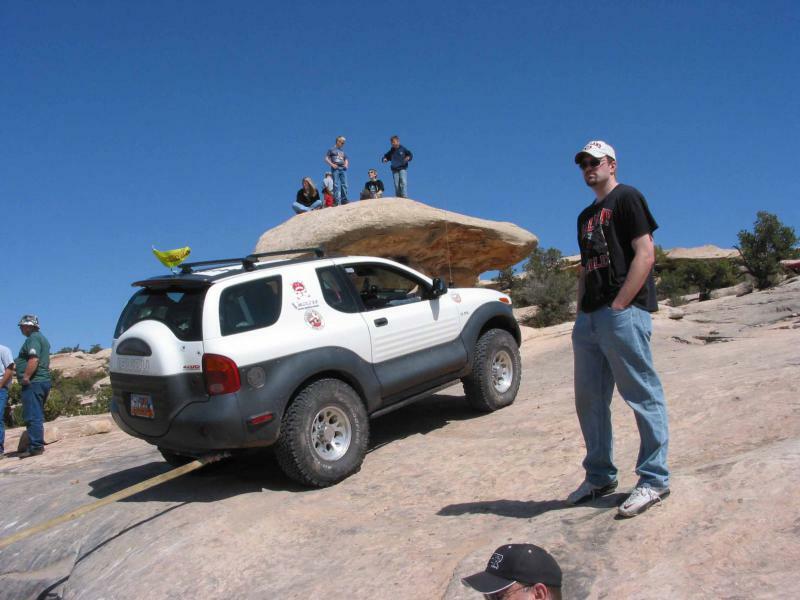 Dubbed "The Waterfall" many vehicles have required assistance to get up it on the way back.